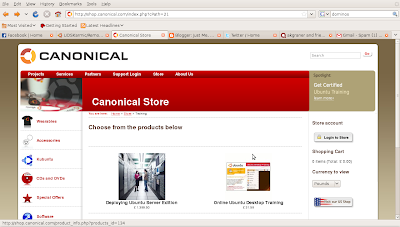 A month (hmm maybe even longer) or so ago I was looking to see if Canonical had any online courses for Ubuntu beginners/desktop users (or average end users) and if so were they stand alone or did they build the skill set up to getting certified as let's say an Ubuntu Professional or something like that. I know that other companies that sponsor Linux distributions offer stuff like this. I decided to look and see. 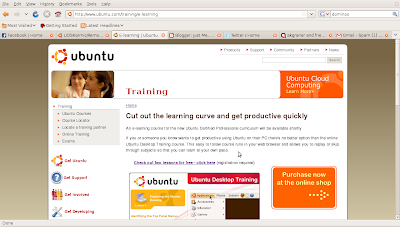 I found out that there is an Ubuntu Desktop Training (elearning) course. I found it when I went to the Canonical Store. Go there and you will see on the left side of the window there are different categories of items you can purchase: Wearables, Accessories, Kubuntu, Cd's and Dvd's, Special Offers, Software, Training, and Supported Services. 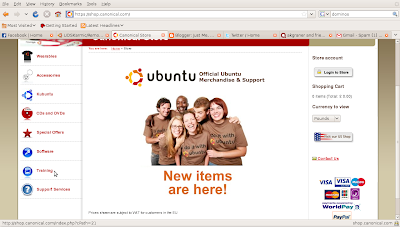 and Ubuntu Desktop Course - Offical Book. 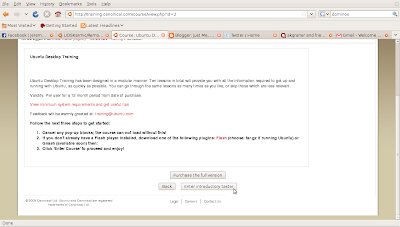 I clicked the Online Ubuntu Desktop Training. 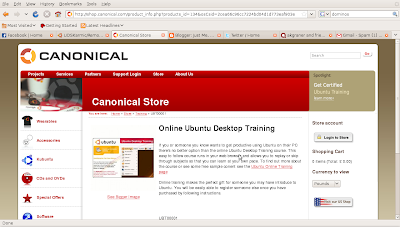 From there I went to the Ubuntu Online Training Page by clicking the red link on the page. When I got to this page there is the option to try 2 of the 10 sessions for free. (it's a blue link on the page, you need to click there) So I decided I wanted to. Seemed easy enough. However, there is a registration that is required. (no credit card or anything, payment isn't needed unless you decide you want to take the full course) You will need to have an OpenID. That is how you will be able to sign into the class. Once you sign in you will get a screen that confirms you are registered and then you need to click the continue button. From there you can decide what you want to do. You can either purchase the full course or take the introductory offer. I chose the Enter Introductory taster, clicked on the link to open the course and up pops a screen with some music and away I went. The course is based on Ubuntu 7.10 and it says that the course is more effective if 7.10 is installed (I wasn't going to install something I would only need for this course). I have 9.04 installed and I still found the information relative. Of course I only took the two free sessions. Also in the introduction it says that if you take the all the courses it should only take you 4 hours. The voice that talks to you through the course is not obnoxious either. (I have taken some elearning classes where the voice was like fingernails down a chalkboard, this voice wasn't like that at all). You can stop and start the sessions as your time allows and the course is good for 1 year after you register/purchase it. So you have approximately a year to get through all the sessions. So in short it's easy to get started. The only tricky part to someone who is new that have seen so far is setting up the openID account, but even setting that up isn't too difficult. If you are giving it as a gift to someone then I am sure you could help your friend or family member out with setting that up in launchpad. :-) Take a look and try it out. Hope you or your family will enjoy it too. It's a great way to give someone an overview and introduce them to Ubuntu with some hands on training, before you hand them a CD or a computer and say here ya go. The only thing is that unless I had gone a search for it, I am not sure I would have heard or found out about the classes from anyone. I think maybe someone mentioned them during open week but I can't remember if they did. (Seems like I would have remembered that since I took the two free session weeks before open week) I am not sure if it's that you have to pay for the classes that keeps people from talking about them, or that it is based on 7.10, or if it's that people don't know they are there, but whatever the reason I am glad that I found them and I will be glad when I finish the whole course as well.